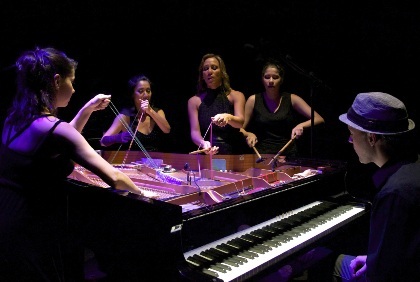 Four classically-trained pianists and one percussionist make up Brazil’s PianOrquestra. PianOrquestra tackles music that veers at times toward dance or pop, with soaring, sweet melodies that can mutate into hypnotic Philip Glassian repetition. The arresting aspect of a PianOrquestra performance is that all five musicians share a single piano. 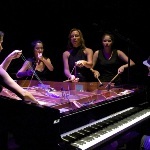 While one or more musicians play at the piano’s keyboard, others take turns manipulating the piano in the manner of John Cage, banging the strings and tapping out athletic, percussive figures on top of, inside and underneath the piano. PianOrquestra have performed to great acclaim all over the world, and they bring their ‘one piano, ten hands’ act to this Classical:NEXT live showcase.